The project, led by Leicestershire County Council in partnership with BT Group, has now made superfast speeds available to more than 70,000 premises, and remains on course to extend that reach to a further 5,000 premises by the end of 2018. Leader of the council, Nick Rushton, said: “This is great news, we are really proud to offer a resource that the public are finding so useful and transformative. “Our aspiration is to have a county that’s well connected, thriving, ambitious, and fit for all the challenges and opportunities the future presents. We are well on our way to achieving this with more than 500 broadband cabinets now connected. 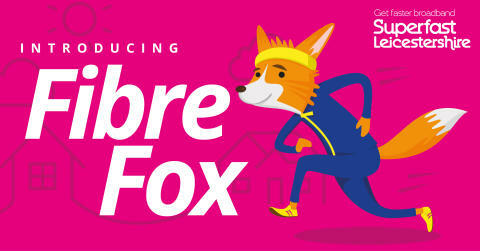 The Superfast Leicestershire team, led by their Flash the Fibre Fox broadband mascot, are keen to remind residents that upgrading to fibre broadband doesn’t happen automatically. To benefit from faster speeds, people first need to check online if their area has been fibre enabled, before getting in touch with their broadband provider. Steve Henderson, Openreach’s regional director for next generation access, said: “We are really pleased to see so many people signing up to access superfast broadband. It shows the importance of our work, in partnership with the county council to make the technology widely available, particularly in rural areas. The most recent parts of Leicestershire to benefit from superfast fibre broadband include Appleby, Rolleston and Wistow, who are getting a fibre connection for the very first time. For more information about Superfast Leicestershire visit www.superfastleicestershire.org.uk or look out for #SuperfastLeics on Twitter.